Periorbital and orbital bite injuries are difficult injuries to be seen by an ophthalmologist. Patients usually have a combination of sharp and blunt trauma injury, contaminated with a large number of pathogenic organisms. Successful treatment of these injuries depends on an accurate assessment of ocular and periocular injuries in an often young and uncooperative patient. Doctors must recognize that there is a possibility of lethal injuries and must institute prompt wound decontamination and surgical repair along with logical use of intraoperative and operative antibiotic therapies. Mammalian bites, the vast majority of which are dog bites, have reached epidemic numbers in the US. An estimated 1-2 million bites from animals occur each year, most of which are not reported. Such injuries account for about 1 percent of all ER visits in this country. Fortunately, most dog bites are minor and are easily treated. About 44,000 facial bites occur each year, of which 16,000 are considered severe. The most involved body areas are the lips, cheeks, and nose; orbital and periorbital injuries make up about 4-8 percent of cases. Most severe facial bites occur in children. Over half of these bites occur in children under the age of 5 years and two-thirds occur in children under the age of 10. Males and females are equally affected. Possible explanations for the age distribution include the short stature of children and inexperience with dogs. In almost all instances, the dog is either a family pet or a dog otherwise known to the victim. Fortunately, since few bites occur from stray animals, the dog’s health and rabies vaccination status are usually known. It is absolutely essential that this type of information be gotten as soon as possible so that the dog can be examined and confined. In most localities, the doctor is required to report dog bites to public health departments with the health and rabies information included. Most dog bites come from large working dogs with German shepherd or shepherd-mix accounting for the majority of bites. 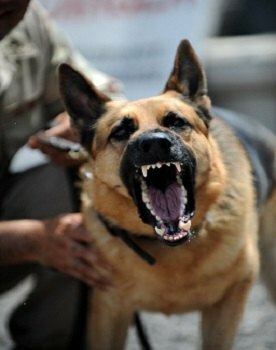 Although any dog is capable of biting a human, the most likely such animal is a young male dog between 6 and 11 months of age. Usually the situation is typical. The responsible adult has turned his or her attention away from the dog and the child. A commotion is heard and a child is found bleeding with the dog cowering in the corner. Although an injured animal or one purposely teased may occasionally bite, most bites seem to be unprovoked. Almost every bite can be explained as a response to a threat to a dog’s sense of territory. Dogs are one of the few animals that do not limit territoriality to conspecifics, viewing humans in much the same way as they view other dogs. The incidence of bites peaks in the afternoon and early evening. This is the time when most dogs are likely to be on their own ground and prone to displays of territoriality. Most bites occur in the summer and winter as opposed to the spring and fall, the exact significance being unclear. Most victims of periorbital dog bites come for treatment early, within four hours of the bite. In addition to the usual items in the medical history, the tetanus status of the victim must be determined to determine what preventative against tetanus must be given. The physician must also ascertain if the patient has had a splenectomy, is otherwise immunosuppressed or is suffering from a chronic disease such as alcoholism or COPD. Such patients are at particular risk of developing septicemia within 24-48 hours after the bite, caused by overwhelming infection with a particular type of gram negative bacterium found in dog saliva. The medical history of the dog must also be obtained at the time of injury. The dog that has not been vaccinated against rabies must be examined by a veterinarian. In most locations, a ten-day quarantine is mandatory. If there is any question of possible rabies, the public health authorities must be notified immediately for advice on examining the dog’s brain with immunofluorescent technique at an approved laboratory. The results of this examination can be obtained within 3 hours so that appropriate treatment can be initiated. Although the eye injury may be the most obvious issue following an attack, a strong suspicion of associated injury, especially in the young child, must be present. Seemingly innocuous scalp punctures may hide a severe intracranial injury or facial fracture. Appropriate x-rays should be taken, especially in children under the age of 2. They must also be evaluated for abdominal injuries and potentially serious hand injuries may be overlooked in favor of the facial injury. Dog paws can exert a force of 200-450 psi, which is enough to penetrate sheet metal. Most do bites are a combination of jagged lacerations and relatively open puncture wounds with associated crush injuries. These are usually the result of a single nip. Occasionally, vicious attacks occur that can only be described as an intent to kill, with associated injuries of the throat and neck. In a study of 16 periorbital dog bites, no penetrating injuries of the globe were found and there was no tissue loss. Disruption of the lacrimal system was found in 14 cases. This is usually the result of laceration/avulsion of the medial aspect of the eyelid and sometimes with disruption of both the upper and lower canaliculi. Complete evaluation may need to be done under general anesthesia. Lacrimal system injury should be suspected in all cases with medial canthal involvement. Injury to the upper eyelid may also involve the trochlea and the levator muscle. All periorbital dog bites need immediate, definitive wound decontamination, and most require surgical repair. The upper limit of elapsed time following a bite in which primary repair can be safely undertaken is not known. Most people recommend repair within 8-12 hours after the bite. Because secondary repair of severe eyelid and lacrimal system injuries often gives less than optimum results and all bites need early wound decontamination, repair should be undertaken in all cases unless there is signs of frank infection. In most cases, especially in young children, wound decontamination is best done under conditions of general anesthesia as part of surgical repair of the wound. After examining the globe and excluding globe rupture, wound decontamination must be carried out. Dog saliva contains a million organisms per ml, which is more than enough to cause infection. All wounds, then, should be considered contaminated and something needs to be done to decontaminate the wound. The best way to do this is through forceful irrigation with at least 200 cc of normal saline using a needle and syringe to increase the pressure. This will decrease the risk of dog bite infection by 90 percent. During the irrigation, the cornea must be protected with a protective contact lens. The goal of repair is to restore the normal anatomic structures of the eyes and face. If the lacrimal system is disrupted, repair should begin with a bicanalicular silicone intubation along with microsurgical repair of the avulsed medial canthal tendon with permanent suture. After this, there should be repair of full-thickness standard techniques. Excellent results can be undertaken in children using absorbable skin sutures, obviating the trauma and possible need for general anesthesia when permanent sutures are used. In most instances, there is no tissue loss. Aggressive surgical debridement of the tissues should not be done on the eyelids and, if it is done at all, it should be restricted to obviously devitalized tissue. First the lid margin is restored, followed by repair of the horizontal components of the laceration, which may include repair of the levator muscle in the upper lid and the retractors in the lower lid. The orbital septum should not be repaired because it often results in tethering of the lid. If there is deep penetration of the eye, a small drain may need to be placed for 24 hours. Finally, layered repair of extramarginal defects with absorbable sutures is performed. Tetanus prophylaxis must be considered in all victims of dog bites. In cases without adequate prior vaccination, the use of tetanus immunoglobulin and tetanus toxoid should be given. Rabies is very rare after dog bites in the US. Rabies prophylaxis should be given only if the dog cannot be found or if there are questions raised by the veterinarian as to the health of the dog. Passive and active immunization against rabies should be given. Local reaction to rabies vaccinations occurs in 25 percent of cases. The use of preventative antibiotics in the treatment of dog bites is controversial. The reported rate of infection following dog bites of any kind is variable, from 0.5-50 percent. The single most important factor is the degree of decontamination of the wound. One study reported a rate of 1 out of 215 wounds of the head and neck when prophylactic antibiotics were used. The same protocol without using prophylactic antibiotics resulted in 2 infections out of 145 cases. The conclusion was that no prophylactic antibiotics were necessary if the wound was treated within 6 hours of the injury. Because of the seriousness of eye infection, it seems practical to use prophylactic antibiotics. If preventative antibiotics are used, the choice may be made when the patient is first seen. Gram staining is unreliable in these cases so the choice of antibiotic is difficult to determine. Wound cultures before the development of actual infection have little predictive value and the results are usually not available for 24 hours. Infection to consider include Staph aureus, Pasteurella multicida, and anaerobic bacteria. Other studies have shown infections with Enterobacter species, Pseudomonas species, and Staph aureus. Another study found Pasteurella multicida in 45 percent of cultures. No single antimicrobial agent has been found to be optimal against all of these pathogens. Reasonable choices include penicillin, penicillinase-resistant penicillin, penicillin plus a penicillinase-resistant penicillin, amoxicillin and clavulanic acid, and cephalosporins such as cefadroxil, cephradine, and cefuroximine. Erythromycin, tetracycline and IV cefazolin have also been considered. In patients at risk for DF-2 septicemia (those with a splenectomy, immunocompromised and alcoholics), penicillin should be included in the prophylaxis. I’m Ed Smith, a Sacramento Dog Bite Lawyer handling personal injury cases throughout Sacramento and Northern California. Call me anytime at 916.921.6400 for free, friendly advice.